The UK's Chancellor of the Exchequer Philip Hammond is urging his colleagues on Downing Street to avoid a 'hard Brexit' and seek compromise with the EU, which could – according to Hammond – soften its stance on several key elements of the Brexit deal. 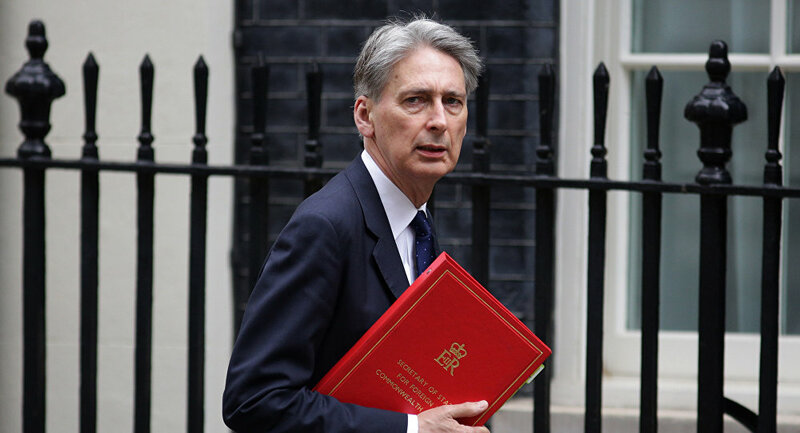 Kristian Rouz — Chancellor of the Exchequer Philip Hammond says a 'hard Brexit' could hurt the British economy in the short-term aftermath of the divorce slated for 29 March. However, Hammond admitted the instability caused by such a move would eventually 'settle down', suggesting the most alarming predictions related to a 'no-deal' Brexit could be exaggerated. In a an interview Friday, Chancellor Hammond said a 'hard Brexit' could be imminent, citing the lingering political uncertainty over the so-called 'Plan B', which Prime Minister Theresa May hopes could be approved by Parliament in the coming days. Hammond said that although the risks posed by a 'no-deal' Brexit are significant, such an outcome should not come as a major shock to British and international companies and investors. "I clearly do not believe that making a choice to leave without a deal would be a responsible thing to do, but I recognise that that is potentially a default that we could find ourselves in," Hammond said. The Chancellor's remarks come as many private sector enterprises have already priced in the possible losses as part of their contingency plans. Companies and investors alike are now seeking ways to move beyond Brexit — regardless of which form it could take. For his part, Hammond also didn't rule out that the British economy could face a recession as a result of a 'hard Brexit'. "It might take us quite a while to sort that out. So there will be a short-term impact through disruption. There will be a long-term impact through a reduction in the size of our economy," the Chancellor said. Meanwhile, Hammond also suggested that the EU could soften its stance on Brexit and abandon some of its 'red lines' as the bloc could renegotiate the proposed Brexit deal with PM May. The Chancellor said some EU leaders are 'looking at what they can do' to amend the Brexit deal so that the British Parliament could approve the accord. For its part, the May cabinet reiterated its position on Brexit, saying the UK would leave the EU on 29 March regardless of the outcome of ongoing talks at home and possible discussions with Brussels. "There is no change to our position," Downing Street said in a statement. "We are not considering an extension to Article 50 (Brexit deadline) and are committed to doing whatever it takes to have the statute books ready for when we leave the EU on 29 March this year." Deal or no deal, the UK is out of the EU in March, the May cabinet said — reflecting the rising influence of hardline Tories and Northern Ireland's Democratic Unionist Party (DUP) in the coalition government. At this point, Theresa May is making finishing touches to her 'Brexit Plan B', which she hopes to get through the Commons in the coming days. Meanwhile, the UK government has been communicating with Germany and France over the past few days. Berlin and Paris appear to be willing to negotiate, as the Eurozone is facing an economic slowdown as well, not least due to the Brexit impasse. "A Brexit without any agreement, without a deal, would be a catastrophe for the UK, but would also have negative consequences for all European countries," French Finance Minister Bruno Le Maire told reporters at the World Economic Forum in Davos, Switzerland. Meanwhile, hardline Tories in Britain said they are in a 'wait and see' mode. They expect May to unveil her 'Plan B' on Tuesday, and are planning to insist on several amendments to the alternative proposal. These could include changes to the so-called 'Irish backstop' — which would keep Northern Ireland subject to some EU rules after Brexit as part of the original Brexit proposal. "There is a lot taking place and there are a lot of new amendments," Conservative MP Amber Rudd said. Meanwhile, Chancellor Hammond said he doesn't believe the EU would change its stance on the backstop, but added that some concessions from the EU are a realistic possibility.